The Samoa U16 Girls National Football team had a busy Thursday. The team joined The Samoa Just Play Social Responsibility team ahead of their game this Saturday. The morning began with the team visiting the home of the elderly “Little Sisters of the Poor” known commonly as Mapuifagalele to present food and goods to its residents. 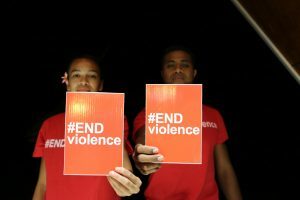 This initiative was driven by the Just Play Social Responsibility program. Samoa Assistant Manager Seimaleula Tunufa’i Mano spoke on behalf of the team at the presentation of the donation which is to assist in the care of the elders living there. It was an emotional morning not only for the elders but for the players who are using the experience as a motivation and inspiration. It was an especially emotional day for the the Samoa overseas based players who were visiting the Mapuifagalele for the first time. 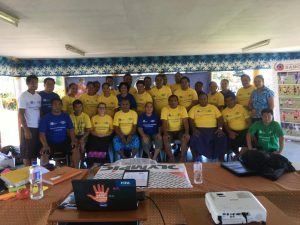 Just Play Project Manager and Samoa Team Manager Lynette Faaiuaso outlined the purpose of organizing this activity was to show that Football and sport can be used as a positive tool for development. One of the elders spoke on behalf of residents to acknowledge the donation and wished the team and management a blessed tournament. The girls spent several minutes after the presentation speaking and mingling with the residents. Many of the players received blessings for their upcoming match this Saturday and several expressed their grateful to the Just Play Program and Football Federation Samoa (FFS) for making this opportunity for them to visit Mapuifagalele. The Just Play program is supported through the kind assistance of the Australian Government, the New Zealand Government, Football Federation Australia, UEFA Foundation for Children and UNICEF. After the visit, the team returned to Tuanaimato where Lunch had been organized by FFS for the team. Invited speakers for the day included Rev. Muao Sua and Associate Minister Lenatai Victor Tamapua. Formalities began with the welcoming remarks of the FFS President Laupama Solomona followed by the opening prayer by Rev. Muao and the Honorable Associate Minister delivering a keynote address to the team on behalf of the Government, the formalities concluded with Lenatai presenting the players with their jerseys.